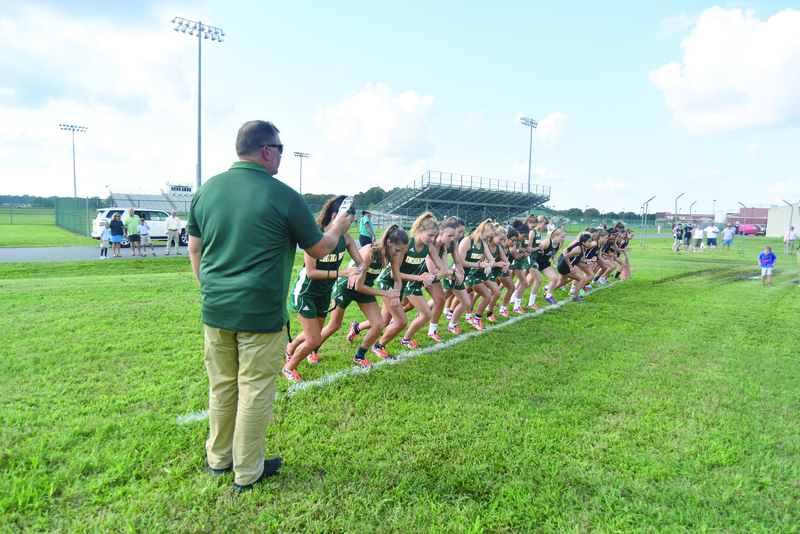 Indian River High School’s cross-country team takes off at the start of their home opener. Indian River High School’s cross-country team suffered a setback in their home opener, losing 21-34 to rival Sussex Tech last Wednesday, Sept. 19. Tech entered the meet with two wins in their pocket and maintained their perfect record so far this season. IR senior Patrick Spencer was the team’s first male runner to complete the 3.1-mile course, which was still muddy in spots from recent rains, especially the night before. Spencer covered the distance in 18:55, but was 0.39 seconds slower than the first runner to reach the finish line — Tech’s Ryan Morrow. Morrow’s takeaway was the speed of the course, despite muddy conditions. Tech’s girls also won their meet, 39-22. Sarah Roehl was IR’s first female runner to cross the finish line at 23:27. For first-season IR head coach Steve O’Boyle, it was disappointing losing his first time out, but he’s positive about his team. He said he is confident wins are in their future. “The boys’ times are going to definitely be skewed, because this course is underwater,” said O’Boyle. “I think most of Sussex County is underwater at this point, so they had to deal with that. And I didn’t put everybody in race shoes yet, as we’ve been doing some hard workouts this week. So the times that I saw today were right where they need to be to continue growing. A lot of them of them are young runners, and this is their first time running a 5K, so I’m real happy with it. “You have to train for it. Every practice has a purpose. Nothing is free, nothing is given. You have to work for everything,” he said. After looking at the result sheets, Sussex Tech head coach Martin Rodrigeuz said, “They all did great. A lot of personal records were broken today. The kids are working hard. They’re committed, and I see a lot of good things ahead for them. The Indians’ next meet will be Wednesday, Oct. 10, when they will host a quad meet at 4 p.m. Competing teams include Caesar Rodney, Poly Tech and Sussex Academy.